There is a certain style of top that I have been attracted to for quite some time. 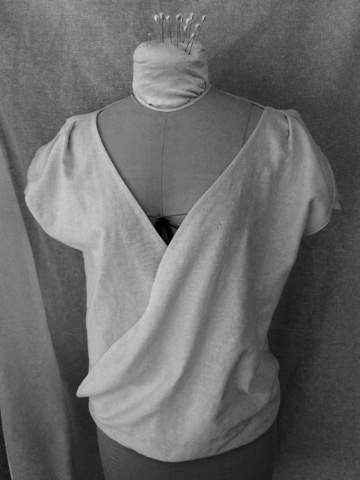 The style that is very draped in the front, with a V-neck line created by the fabric falling over one shoulder then twisting at the waist and coming back up to the other shoulder. 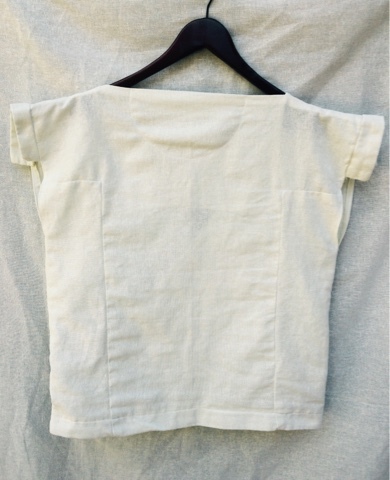 I found a pattern interpretation of this top on this blog and attempted to revise it into a zero-waste pattern. In order to do so, I decided to eliminate the typical curved arm holes and neck line, converting them to straight lines with square shoulders. 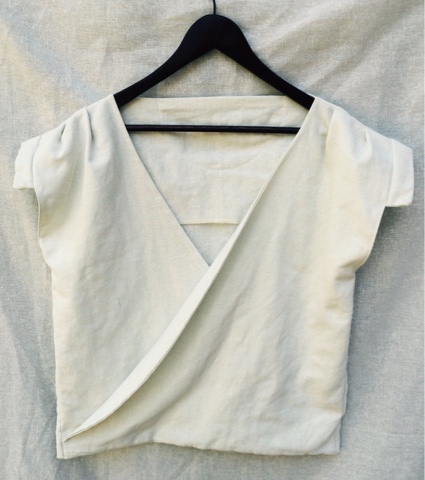 One of the common dilemmas I have faced while trying to create zero-waste patterns is the challenge that is created when you cut a curve into the fabric for a waist line or neck line, to name just a few. 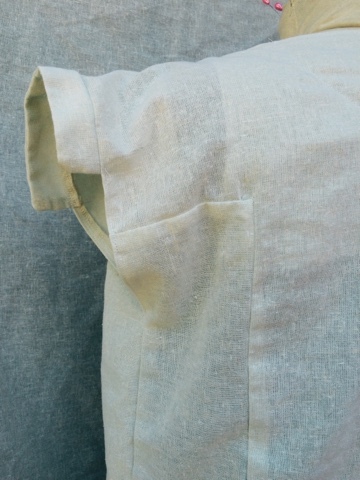 The remaining curved fabric piece does not easily lend itself to the rest of the garment. I have found solutions by using the curve in the hem, which was demonstrated last week, but it goes against what is commonly practiced or commonly accepted as a typical hem line. I have also been able to re-position other pattern pieces to take advantage of the curve such as in Week 3, where the sleeve and the arm holes shared the same curved cut. But again it gives way to a shape that is not typical and added more volume to the resulting sleeve. Without curves the overall garment becomes boxier and shape has to introduced through texture, tucks and darts. 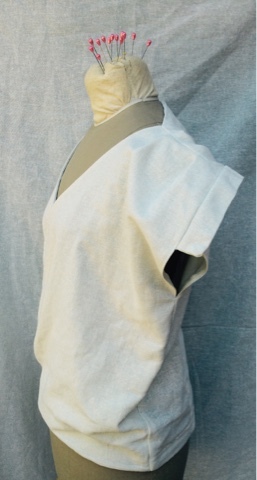 In this weeks top, the sleeve was not a separate, sewn on piece, but rather an extension of the bodice. This looser fitting style seems to be an aesthetic that can be equated with zero-waste design. I believe I could have used less than a yard of fabric to create this style of top, but in order to stay with my self imposed design constraint, I doubled up the fabric for the two front pieces. This left me enough material for the back, which was pieced together with an interesting "T" line, the back facing, which could be smaller, and two funky sleeve caps.